I grated the carrot for doing carrot kheer , but suddenly changed my mind and did this muffin. 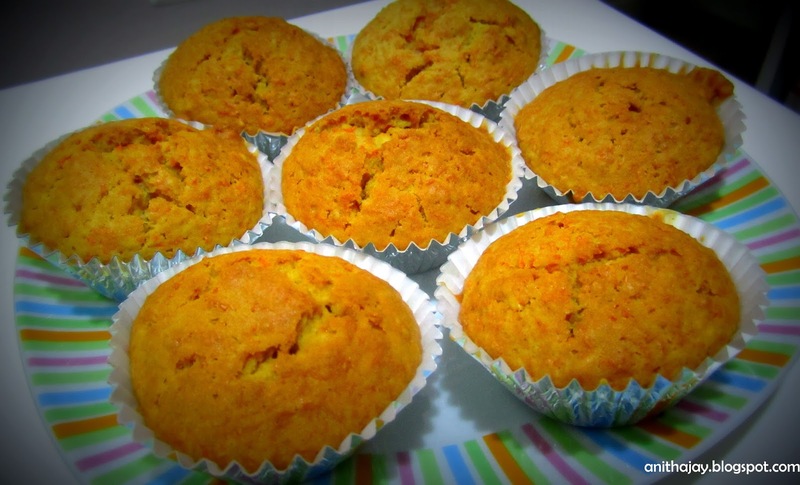 Its good to start a day with this healthy muffin.Below recipe can be made either as a carrot muffin or a cake. In a bowl sift flour,sugar,baking soda,baking powder and salt. In a separate bowl whisk egg,oil and vanilla extract. Fold the wet ingredients to the dry ingredients along with the carrot. Mix well and divide the batter into muffin pan. Bake it for 20-25 minutes or until tooth pick inserted comes out clean. Cool the muffin in the wire rack for 10 minutes and then serve. Love this kind of healthy muffins..very catchy.